• 1094 sqft , 2 bath , 2 bdrm single story – FOR SALE CAD345,000 . Beautiful app. renovated in the “Mayflower” located on a quiet tree-lined street, close to the city center and universities. 2 spacious bedrooms + study, 2 renovated bathrooms, wooden floor, modern kitchen with gas stove, indoor garage and storage space. 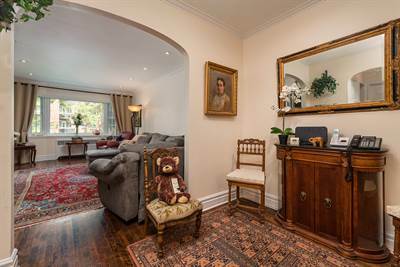 Enjoy the tranquility of Ridgewood Street! The deed of sale and all other documents must be signed before the seller’s lawyer. ** Monthly fees include municipal and school taxes, heating and hot water, maintenance and insurance for common areas, gardening, snow removal, concierge and administration. The building has been renovated: heating system, windows, balconies, garage, electricity, plumbing, roof, entrance and facade, terraces, new laundry room and exercise room.